What is the IEA Technology Collaboration Programme (TCP) on Hydropower? The IEA Technology Cooperation Programme (TCP) on Hydropower (also known as IEA Hydro) is a working group of the International Energy Agency's member countries and others that have a common interest in advancing hydropower worldwide. Countries that are not members of the IEA can also join. The member Governments either participate themselves, or designate another organization in their country to represent them on the Executive Committee (ExCo) and Annexes. What is the Vision of the IEA TCP on Hydropower? "Through the facilitation of worldwide recognition of hydropower as a well-established and socially desirable energy technology, advance the development of new hydropower and the modernisation of existing hydropower "
"To encourage through awareness, knowledge, and support the sustainable use of water resources for the development and management of hydropower. " Increase the current wealth of knowledge on a wide array of issues currently associated with hydropower. Bring a balanced view of hydropower to the worldwide debate on its feasibility as an environmentally desirable energy technology. Joining the Technology Collaboration Programme (TCP) on Hydropower? The IEA Hydropower TCP is keen to promote its work programmes within participating countries and to encourage further interest in its work from non-participating countries. Participants in the IEA Hydropower TCP are nominated by the Contracting Parties, and represent government departments, national energy agencies, academic, research or scientific organisations. All participants must join at least one Annex. If you are interested in finding out more participating in the IEA Hydropower, please contact the ExCo Secretary. How is the programme of work carried out? 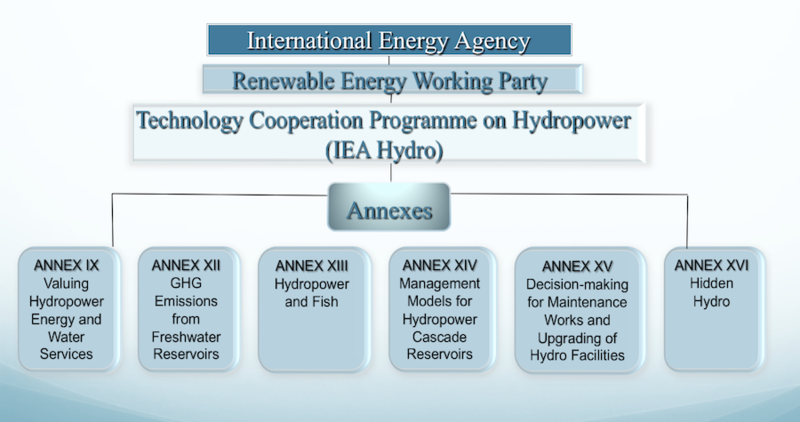 The Hydropower TCP's programme is carried out by task forces, called Annexes. Member Governments can participate themselves, or designate another organization in their country to represent them on the Annex. Some activities are collaborative ventures between the TCP and other hydropower organisations. See Current Activities for detailed information on the work of all Annexes and how you can become involved. Technology Cooperation Programmes have a standard legal structure defining the commitments and rights of Contracting Parties. IEA Member countries participate in Technology Cooperation Programmes (TCP's) on a voluntary, case-by-case basis. Contracting Parties undertake Tasks identified in Annexes to the TCP. The Annexes usually specify arrangements for handling and protection of information and intellectual property, and record arrangements for commercial exploitation and distribution of benefits. Contracting Parties designate one Operating Agent for each Task who is responsible for management of the collaboration and provides infrastructure as needed. While all Contracting Parties are signatories to the Technology Cooperation Programmes and its general provisions apply to each, participation in the Tasks under Annexes may vary according to the parties' wishes and additional Task Annexes may be added as the the Technology Cooperation Programme proceeds. While most participants are government organisations or semi-public entities, Technology Cooperation Programmes are open to private organisations formally designated as participants by their national governments. To enhance interaction with industry and other users of results of the collaboration, options exist to involve expert groups from multilateral organisations and industry, where they can make a substantial contribution to the programmes. International inter-governmental organisations may participate as Contracting Parties and industry bodies not directly nominated by governments may participate as Sponsors with the approval of the TCP Executive Committee. IEA Hydro is keen to promote its work programmes and to encourage increasing involvement of non-participating countries. All OECD and non-OECD countries are eligible to join.If you are interested in finding out more about IEA Hydro, please contact the IEA Hydro Secretary.